1. The whole factory production, convenient construction, shorten the villa construction period, improve the villa of the real estate industry economic benefit and social benefit. 2. Good rigor, no leakage, thoroughly solve the problem of brick pool leakage pollution of groundwater. 3. The new composite materials resistant to acid corrosion, durable, service life for seventy years. 4. 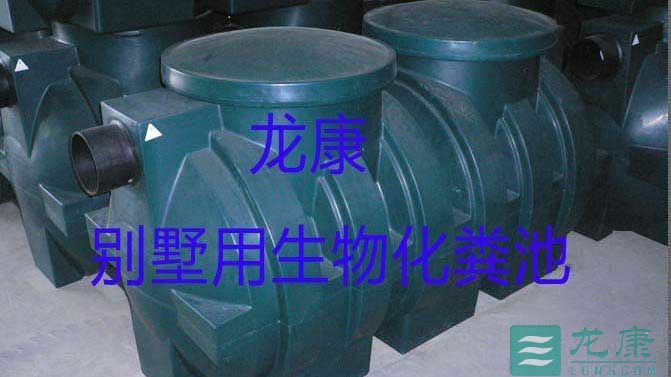 Glass fiber reinforced plastic septic tanks is qualitative light, easy to install, quick construction, short construction period, greatly saves the artificial. 5. Volume of 1.2 cubic, 2 cubic, 4 cubic, complete specifications, to solve the problem of two households villas Shared a septic tank. Imported high quality green polyethylene (PE) as the principle, rotomolding one-time molding.Products with whole sealing, no leakage, high strength, impact resistance, compressive load is big, acid and alkali resistance, corrosion resistance, light, durable, easy installation, convenient and economical, the sewage treatment effect is good, long life and other characteristics.The international patented technology products, has ten years experience in application of developed countries, technology is mature, maintenance is convenient. Precipitation corrupt area: to precipitation of sewage, sewage processing than big sink to the bottom of material, the proportion of small part of the floating on the surface of the upper, from clean mouth out, while at the same time, the waste water produced sewage, and develop a very strong adaptability and activity of microbial groups, make part of the complex difficult decomposition of organic matter degradation for easy decomposition of the material. Partition: straight into water circulation water, increase water in the pool, retention time, make precipitation sludge in sewage pool and lift longer and produce more of the microorganisms, to decompose to devour the sewage. Filter processing area: adopt advanced biological membrane method processing technology at home and abroad, after a certain time in the area of cultivation, breeding a large number of microorganisms in the filter surface biofilm formation, sewage contact with biofilm on the surface of the filter, the organic matter in the wastewater is microbial intercept flow, adsorption and decomposition, so as to realize the effective purification of the sewage treatment. Residence community, office buildings, hotels, schools, hospitals, barracks, public toilets, people living buildings and other places of sewage treatment, food processing enterprises of water treatment. (1) Earthwork excavation digging holes open slot size should be performed according to the septic tank capacity size excavation, according to the type of soil quality and implement, pit slot depth according to outdoor piping elevation. (2) Basic level processing After the foundation bed leveling cement, 10 cm thick concrete as base of septic tanks. (4) Hierarchical compaction backfill In the sand pit space is left over is filled to the top. (5) Cutting inspection Wells in the septic tank inlet, check the mouth, clean up the mouth, outlet position cut up inspection Wells to outdoor ground elevation. (6) Ground processing According to the actual situation.